Vancouver is the biggest city in British Columbia Canada. It's a city known for being on the west coast and surrounded by mountains. There is a good number of vegan places to eat in Vancouver. The city is probably best known for Stanley Park, for hosting the 2010 Olympic games, and for being used as a filming location for a lot of hollywood movies. Why You Should Go: Vancouver is a great place to visit for the west coast scenery, exciting neighbourhoods, beaches, events and to experience the laid back west coast way of life. Vancouver has a transit system including light rain Skytrain and Canada Line making it easy for visitors to get around. Getting to Vancouver: You can fly into YVR international airport which is well connected to the city with taxis and public transit. You can get to Vancouver by train from Seattle. It is also possible to get the train into Vancouver from other parts of Canada but it could be quite a long trip. If you are on Vancouver Island you can take BC ferries to Vancouver. How vegan friendly is it? 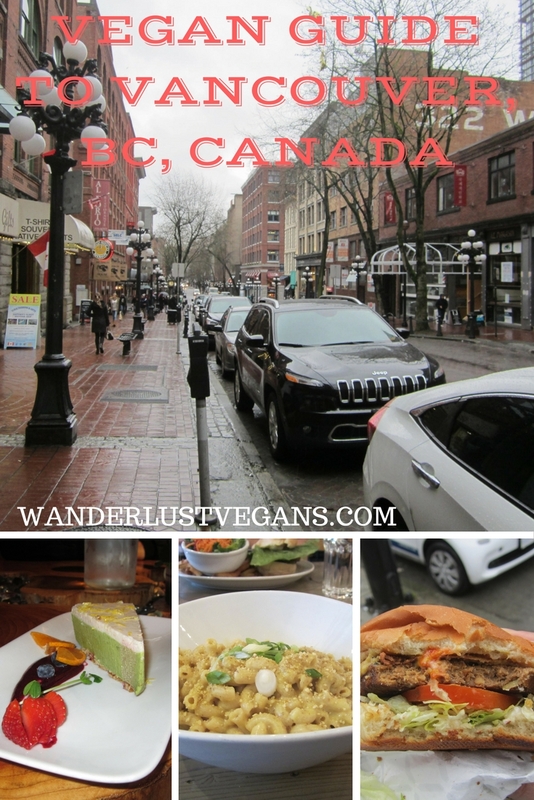 We found that Vancouver had quite a few places to choose from for vegan food. We haven't got the chance to try all of the places with vegan food but we have tried quite a few. A few places we have tried are Loving Hut Express Food Cart, Bandidas Taqueria, Meet on Main, Nūba in Kitsilano, Indigo Age Cafe and 3G Vegetarian Restaurant. Loving Hut Express Food Cart: This is a food cart that we love to go to whenever we visit Vancouver. It's located in Yaletown. This place only takes cash which always gets us off guard. The burgers here are great because the cheese sauce is so good. We wish this place was more than just a cart but the burgers are worth it. It's not bad when the weather is alright but sometimes you would prefer not to eat outside. MeeT On Main: This place is a great and it's the kind of place you could take your non-vegan friends and family without them leaving their comfort zone. Everything is vegan here but they serve burgers and mac and cheese. It's comfort food with a casual atmosphere and there isn't a load of ridiculous hippy nonsense that is going to put off your non-vegan pals. You can also 'MeeT' in Gastown and Yaletown. Indigo Age Cafe: Our favourite raw food place, Gorilla Food, went out of business but luckily a new awesome vegan cafe opened in the same space. They have vegan high tea, lots of smoothies, desserts, raw key lime pie, and much much more. They even serve Ukranian food including Pierogies! That should be reason enough to go. Firecrust Neapolitan Pizzeria: It is organised like subway, but it is pizza! We were pleasantly surprised that they had 3 vegan pizzas on their menu. No substitutions needed! They carry chicken, sausage and parmesan cheese from YamChops. You can order one of their pre-designed pizzas or create your own. They have large salads you can create as well. Cartems Donuts: They have a large selection of donuts! We got the Smoked Walnut, Chocolate glazed, Vanilla Bean, Citrus glazed and Earl Grey. They had a couple other vegan ones to try too. It seems that most of their donuts are vegan. They are very delicious but are quite pricey. If you have been craving a donut since you have been vegan, head on over to Cartems Donuts on W Pender St.
For more vegan options in Vancouver check out Happy Cow which has a comprehensive list of vegan, vegetarian and veg-friendly places to eat. Happy Cow states that Vancouver has 19 fully vegan and 31 vegetarian places. Sight Seeing: There are a lot of sights that make a trip to Vancouver well worth it. Gastown is known for it's steam clock and Victorian buildings. Granville Island is known for its Public Market. Stanley Park is a must see as well with all of it's natural beauty. Go there and check out Siwash Rock, Prospect Point Lookout and the Totem Poles. Where to stay: We have stayed a number of different places in Vancouver over the years. We've stayed with friends and family but that might not be an option for you. The Cambie hostel is a budget option but be prepared to sleep above a ragingly loud bar. The Sandman Hotel is a reasonably price hotel near the Stadiums which can be a good option. Otherwise there is lots of other hotels, there is airbnb and there is hostels. Check out Vancouver's city guide for more information on their tourism. Have you been to Vancouver before? What is your favourite thing to see? Have you ever been to Gastown? We like Vancouver a lot. We loved visiting the vegan places. But the murals! I'm such a sucker for awesome murals! Absolutely. There is lots in Vancouver.